All the information on UX roles, salaries, and other industry stats! If you’re a creative type, a problem solver, an empathetic listener, or a combination of all three, a career in User Experience might be a perfect entry point for your pivot into the tech industry. Yes, working in tech CAN happen through more familiar tech roles like web development or web design, but User Experience (or UX or UX design as you’re likely to see it referred to) offers a chance to work on people-first projects while still reaping all the benefits of tech’s high starting pay and flexible schedules. But what IS UX? And how exactly can you start working in the field? It’s funny you should ask. We’ve put together this ultimate guide running down everything you need to know (and then some) about finding work as a UX designer (or any other role that falls under the UX professional umbrella). Don’t feel pressured to take in all this information at once! Bookmark this page and come back as often as you need when you start charging ahead on your own UX odyssey. 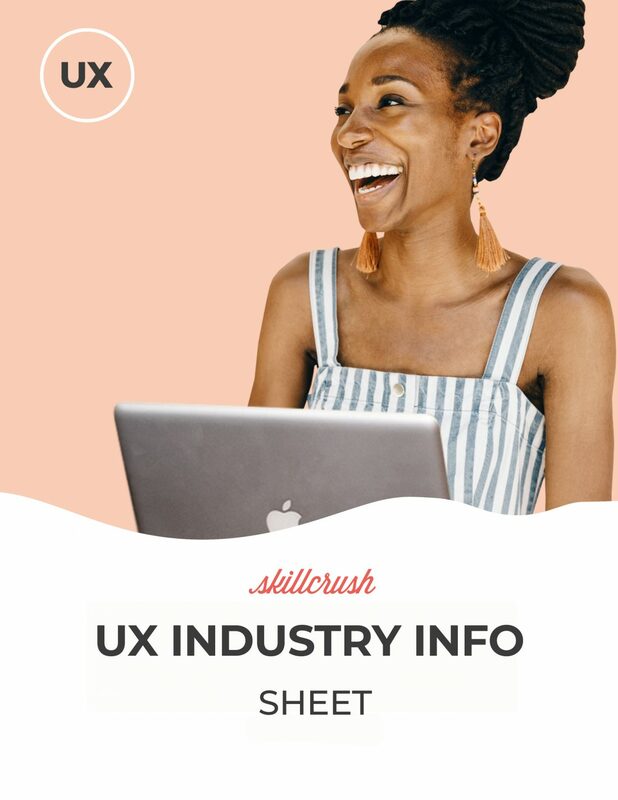 And one last thing: make sure to download our free UX Industry Info Sheet from the top or bottom of this page and take some of the most salient UX facts and figures with you. Chapter 1: What is User Experience? What is UX Design? And What About UI? Definitions please! Ok, first thing’s first: a quick definition of user experience. UX, the tech acronym for “User Experience”, is a tech field that involves researching groups of people who use digital products (like websites and apps) and using the findings to literally improve users’ experiences with those products—the way a product makes the user feel while they use its features, how easy the product is to use, and how appealing users find the product overall. Then, What is a UX Designer? UX is often interchangeably referred to as UX design (and UX professionals are more often than not called UX designers). This can be misleading (and confusing!) because there’s more to user experience than just the “design” component. It’s also important to keep in mind that you don’t need a traditional design background to work in UX. But if there’s more to UX than design (and if “UX design” differs from traditional print and digital design) what do UX designers and other UX professionals actually do? What do UX Designers (and other UX professionals) do? The UX process can be broken down into three general categories (which show up to varying degrees in any UX job based on specific job descriptions and what your particular employer is looking for). UX Research. Research is the foundation of UX. Without researching customer experience through interviews, product testing, etc, there’s no data to use against product changes and improvements—which basically means no UX. UX research plays a part in every step of the UX process, but can also be its own UX career path (proving there’s more to UX than “UX design”). Information Architecture. Information Architecture is the heart of “design” in UX design. After user research has been collected, it’s time for UX designers to craft a strategy for implementing that data—in other words, a user experience design. Product Iteration Testing. Part of what makes UX such a great field for creatives is the fact that it isn’t a factory line process. You don’t mindlessly crank out a UX design, call it “done” and move on to the next one. Instead, iteration is a critical part of UX, allowing UX researchers, designers, and other industry professionals to apply their creative problem solving to multiple versions of a product during its development lifetime. Product iteration testing is the stage in the UX process where a current version of a product is presented to clients, users, and other stakeholders, after which collected impressions are applied to the next product version. To add to the fun, when you start reading up on UX and UX design you’ll probably notice mention of “UI” as well—sometimes even in the same breath (as “UX UI”). Is UI just another way of saying UX? Well, not really. Think of it this way: if UX deals with EVERYTHING related to a brand or product experience, (tech shorthand for “User Interface”) is one piece of this bigger picture. UI operates on the same basic principles and methodology of UX, but focuses these skills specifically on a product’s interface (a website’s or app’s menu, screen layout, sitemap, form placement, etc). In this sense, UI design can be considered more adjacent to traditional web or graphic design than general UX, making it a particularly good transition point into the industry if you DO already have print or digital design experience. Some of the skills needed to land and succeeded at a job in UX don’t require a single day of UX training. As mentioned above, if you like to listen to people and understand their problems, if you enjoy critical thinking and problem solving challenges, or if you excel in creative environments, you’re already off to a good start. But what about the UX-specific skills you’ll need to add to your toolkit if you want to work in UX UI? Here’s a snapshot look at the crucial skills needed for each of UX’s primary areas (and don’t hesitate to consult this companion article if you need a deeper definition for any of the skills listed). Wireframing (the process of creating visual wireframe models used to map out the basic structure of a website or application. In addition to skills, tools are an important part of the UX trade. Both Figma and Invision are intuitive and easy to learn (making them ideal for beginners), but they’re also industry standard programs used by UX pros worldwide. Even better, they are free to use when starting out. Both tools offer no-cost plans that allow you to complete and store up to three full projects, which is perfect when you’re learning the ropes en route to paid work. If you’re wondering where you can start learning these skills and tools, that part’s easy. Look no further than our Skillcrush User Experience Design Blueprint—an online course designed to be completed in only 3 months (if you spend about an hour a day). Our course will walk you step-by-step through the skills listed above, as well as get you hands on with Figma and Invision. Chapter 3: What is a UX Designer Salary? Ok, enough hype about the job itself, let’s get down to brass tacks: how much can you expect to make working as a UX UI designer? When we posed the UX designer salary question previously, Alison Sullivan, Career Trends Expert at jobs and recruiting site Glassdoor, reported that Glassdoor cites an average base salary of $107,880 for UX designers and an average base salary of $86,883 for UI designers. She added that—in addition to the money—UX design jobs ranked #27 out of 50 among Glassdoor’s recent Best Jobs in America report, a claim that’s reflected by Glassdoor’s own job listings. As of this writing, Glassdoor has over 5,000 UX designer jobs posted on its site, and nearly 5,000 UI designer openings. You can read more about UX design salaries (and what it takes to earn them) here. Now that you have an idea of what UX is about, what kind of skills and tools you need to work as a UX designer, and how much money you can expect to make, how exactly do you go about finding a UX job? Besides staying on top of job boards like Glassdoor and Indeed (as well as as UX-specific boards like the aptly named UX Jobs Board, UX Design Jobs, and Smashing Jobs, there are some proactive things you can do on your end to up your qualifications for those job listings. Just because you’re not getting paid to do UX work yet doesn’t mean you shouldn’t be doing UX work. Let me explain: one of the best way to gain experience and have a demonstrable body of work before getting hired for your first job is to harness your UX skills as you learn them and start working on mock projects. Use Figma or Invision to create wireframes and prototypes of a UX rebranding for a website or application (it can be fictitious, or even a spec project overhealing the UX of one of your favorite real world sites or apps). By creating a mock body of work en route to your first paid gig, you’ll be able to show potential clients (and yourself!) what you can do. This article on how to create a web design portfolio with mock projects can be applied to UX as well. Having a crisp, easily shareable digital portfolio is a must in order to win over UX clients and hiring managers. But what does that mean? First, you need to find the right site to house your digital samples. This article on free design portfolio sites will lead you in the direction of stalwarts like Behance and Dribbble, both of which work just as well for UX portfolios as they do for web and visual design. Second, you need to make sure you’re including the kind of UX samples that will resonate with clients and employers. This article will give you a list of seven foundational projects to start building a stellar UX portfolio, after which you can level up your portfolio game even further with this 4-step guide to making sure your work shines. In between trolling job listings and compiling a knockout portfolio, life sometimes just happens. You never know when you might be in a situation where you’re suddenly face-to-face with someone who can hook you up with that dream UX job. Which means you better have something to say when and if the time comes. No problem, we’ve got that covered, too! If you need a little help explaining who you are, what sets you apart, and why (despite maybe not having the most on-paper experience) you’re the person to solve a company’s problems, go ahead and download our guide to writing the perfect personal pitch. The tech industry may have changed a lot of the ways we work and find jobs, but one institution remains the same—the venerable cover letter and resume. In order to really nail that UX job, you’re going to need both. Because you’re new to the UX, it’s critical to write a custom cover letter when applying for jobs. Take the time to research the company or client you’re applying with, notice any trends in their projects or even problem areas (what could they be doing more of? ), and make sure to include those observations in your letter. You can even mention a personal experience you’ve had with the company, too. The more original, the better. Finally, when it comes to your resume, it needs to live up to the same high UX standards as the portfolio and projects you’re showcasing. The good news is, there are plenty of free resume templates that will hit that standard for you, giving you one less thing to spend your creative energy on. Check out our list of free creative resume templates for 2019 here. We’ve said it before and we’ll say it again: tech jobs are flexible. And part of what makes them so flexible are the freelancing opportunities available in every tech field. Whether it’s web development, web design, or digital marketing, tech jobs run the gamut from full time jobs for a single company, to freelance careers, to part time side hustles you can do while caring for children or building your skills. UX is no different. If side hustling appeals to you, or if you’re looking for a way to do paid projects while building your skills AND your portfolio, don’t forget that freelance UX work is always an option. Of course, if you’re going into business for yourself, you’re going to need some support. Meanwhile, you can check out our own guide to calculating a freelance web rate here (this article is about web development and web design, but the same principles can be applied to UX), and you can download our calculator for freelance web design rates here. One of the big questions asked about working in UX is whether or not UX designers or other UX professional need to know how to code. The short answer? Absolutely not. If you’ve gotten this far you probably noticed there hasn’t been single mention of coding skills, and it’s entirely possible to have a lucrative UX career without knowing any coding languages. That being said, digital skills are stackable, meaning the more you know, the more career options and flexibility you’re going to have. Even the most basic coding skills will add to what you can accomplish as a UX professional (as far as being to able to communicate with developer teams, understanding the technical limitations of projects, being able to make quick fixes to websites, etc). The same can be said for web design (a particularly handy skill for maintaining and curating your digital portfolio) and digital marketing (understanding digital marketing principles will give you yet another tool in your toolbox for selling users on their experience with a product). This kind of stacking is particularly important when you’re trying to get your foot in the door with a company of if you’re in the early days of freelancing—a freelance UX designer is one thing, but a freelance UX designer who can also design and/or develop a client’s website becomes a full service digital design studio. If you’re sold on UX, but also interested in branching out and stacking some additional digital skills, our Blueprints (which you can read more about on our Courses page) are purposefully designed to let you do just that. And if you sign up for our Break Into Tech Blueprint, you’ll have access to ALL of our courses and materials, putting you in position to become that proverbial one-person tech powerhouse. You’re still here! Which means you’re probably ready to get serious about this whole UX thing. Interest and commitment is a big step, so congratulations! But now it’s time to take the next one: consider signing up for our Skillcrush User Experience Designer Blueprint today, and you’ll be well on your way to a high paying, flexible, creative career in UX. And while you’re at it, download our free UX Industry Info Sheet from the form below and keep it as a reference for some of the most key UX industry facts and figures.